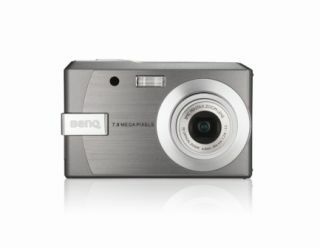 BenQ has added the sleek-looking BenQ E1000 to its Elegant range of digital cameras. The BenQ E1000 features a 10-megapixel CCD sensor, 3x optical zoom and a 3-inch LCD screen. It has ISO1600 light sensitivity. And it includes 24 scene presets with unusual modes such as Oil Painting and Sketch, all crammed into a black finish housing. The E1000 also includes Face Recognition technology that enables the camera to automatically detect up to nine people in a scene. It then optimises the camera's settings to capture them at their best. The E1000 has two image stabilisation options. The first is an anti-shake key next to the shutter that enables you to access the camera's image stabilisation functions. The second is Super Anti-Shake, a feature that optimises the camera settings for shooting in low-light conditions with minimum blurring. The E1000 also sports two different anti-shake modes, one manual and one automatic. In the manual version, a button automatically controls the ISO settings and reduces the shutter speed when needed. In the automatic version, software settings on the camera's menus introduce a dynamic anti-shake mode that adjusts ISO and shutter speed instantly depending on the conditions. The BenQ E1000 will go on sale in China later this month, with the rest of the world following after that. BenQ could not confirm a UK launch date at this stage.